The first community of Muslims showed tremendous courage. Despite horrific persecution and ongoing threats to life and limb, they stood by the truth of prophetic revelation, waging all-out jihad (effort, struggle) so that truth should triumph over lies. "Your number will be great. But you will be without substance, like the foam on the face of a river; and Allah will remove from the breasts of your enemies the fear of you; and Allah will throw wahn into your hearts.' One of the companions asked, 'What is wahn, O Allah's Apostle?' And the Prophet responded, 'Wahn is to love this life, and to hate death!'" American Muslims love the good life so much that they have become complicit in a genocidal big lie against their community - against their sisters and children and brothers in Islam, and against themselves. Two million Muslims have been murdered on account of this blood libel, yet few speak out. American Muslims know that 9/11 was an inside job. The polls tell us that about two-thirds admit this openly to a non-Muslim stranger working for an opinion research firm. The actual figure, considering that people tell pollsters what they think the pollster wants to hear, must be closer to 90%. Yet only a tiny fraction of that 90% of American Muslims stands up for truth. How many tithe to Architects and Engineers for 9/11 Truth or contribute to Muslims for 9/11 Truth or The Wisdom Fund? How many organize demonstrations and events in their communities? How many distribute DVDs and books proving the 9/11 inside job to their friends and acquaintances? How many demand that the Muslim community stand up en masse for truth? The vast majority of American Muslims seems to be expecting Allah to be extraordinarily merciful. For if they ever face rigorous justice, they will surely burn in hell for their cowardice. A good example of this hellfire-bound cowardice is the angry response of some Muslims, or people calling themselves Muslims, to a leading Missouri political figure, M.D. Alam, who had the courage to speak out for 9/11 truth. I have read over your material. You are making life more difficult for Muslims in the U.S. Please stop. Politics appears to be your passion, but it is not your forte. I appreciate that you are trying to get involved in a civic area that is noticeably lacking for Muslims. But you do not have the language or social skills to interface in this highly-nuanced field where every word can and likely will be analyzed by pundits and Islamophobes. You obviously have some skeletons in the closet with your public online comments about 9/11 conspiracies. That's regretful. These missteps, your writings, and talks without any specifics on YouTube reflect on the larger Kansas City Muslim community. You obviously don't represent us, but you and will be the "Muslim candidate" or "Muslim Democratic operative." Please stop. We will all by questioned by our Creator about how we worked for this religion; I am telling you sincerely that I fear for your questioning and the ultimate harm you are doing to the already battered public face of this faith. For the sake of Allah, please stop dabbling in local and state politics to the detriment of Muslims in Missouri and nationwide. Grassroots political efforts are fine for anyone, but running for political office on a long-shot candidacy with tepid Muslim support and without the finely-tuned support, staff, and skills needed for a political office run on the state level is at best embarrassing and at worst irresponsible and problematic. Please stop. In fact, it is the damnable cowards like Mark (assuming that Mark is Muslim - there are undoubtedly many psy-ops professionals at work in this field) who have "made life difficult for Muslims in the US." Had American Muslims risen with one voice to denounce 9/11 as the obvious false-flag operation that it was, and put all of their energy and resources into 9/11 truth, two million of our brothers and sisters would still be alive, and tens of millions more would not have had their lives ruined. But the cowards whispered like the demonic waswaas: "Think about your reputation with the non-Muslims! Your job! Your family! Your high standard of living! You could lose all the wonderful things in this dunya if you stand up for the truth!" 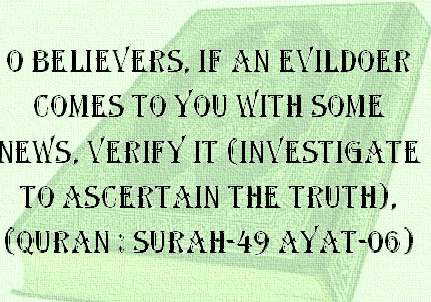 And most Muslims obeyed the whisper of the shaitan. M.D. Alam is one of the few who did not. For standing up and speaking the truth - the truth that 90% of Muslims inside and outside the United States know and, at least in their hearts, acknowledge - he has been assailed by the same sort of people who stoned and crucified and made war on the Prophets of God. It is true that M.D. Alam is a second-language English speaker, and that his remarks on 9/11 should have been more precise and accurate. But at least he had the courage to speak up! And when the inaccuracies in his choice of wording were pointed out to him, he apologized and corrected himself. Will the cowards who have not stood up against the genocidal Big Lie of 9/11 ever apologize and correct themselves? They had better do so as soon as possible, and make sincere tawba. Allah knows that they are complicit in the racist slaughter of two million of their brothers and sisters based on the biggest lie the Shaitan ever told. By not standing for truth, they are standing for the Shaitan and his lie. When they meet their Lord, they are going to have a lot of explaining to do. Thank you for all your hard work in promoting 9/11 truth Kevin Barrett.